The ENC16/18 is a weather-resistant enclosure that is 16 inches wide and 18 inches tall. It can house a data logger, a power supply, and at least one peripheral. This enclosure is recommended for applications that need to have multiple communication or measurement and control peripherals housed in the same enclosure. The ENC16/18's backplate is prepunched with half-inch-on-center holes suitable for attaching a data logger, power supply, and a communications or measurement and control peripheral. What can be done if an enclosure gasket becomes torn or damaged? 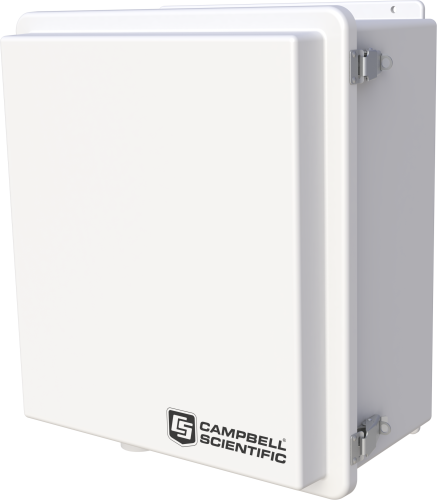 If you purchased a Stahlin enclosure from Campbell Scientific and it has a failed gasket, we can help you. We will need you to provide an image of the failed gasket, verify the size of your enclousre, and provide your contact information. We can then arrange to have a replacement gasket sent to you from Stahlin. For assistance, contact Technical Support at 435.227.9100.